Take a bowl. Add all dry ingredients, tutti fruiti and mix it well. Take another bowl. Add curd, vanilla essence, oil, water and whisk it well. Add this to the dry mixture. Mix it well. 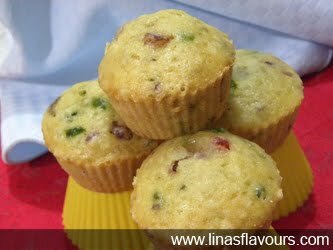 Take muffin cups and pour the batter 3/4 cup as it will rise when baked. Bake it for 20-23 minutes till it is done. Insert knife to check it, if it comes out clean then it is done otherwise bake it for 2-3 minutes more. Take it out and let it cool completely.